Anpanmans rival. The villain from "Germ World" is the leader of the Viruses. His Japanese name means "Germ Man." 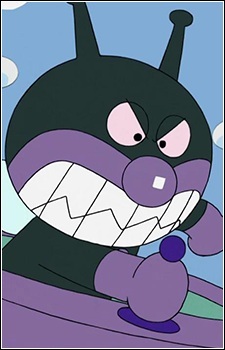 His ambition is to destroy Anpanman and turn the planet into another "Germ World", yet he is perfectly content to play tricks, steal, and bully those weaker than him. He and Anpanman were born at the same time, making them physical representations of moral dualism. He has a weakness to soap, which shrinks him to the size of a fly. He constructs machines and thinks of intricate plans to counteract Anpanman's strength. Baikinman is the model for Team Rocket at Pokemon.